Acer launches Chromebox CXI, for 179.99 dollars. Chromebox are the equivalent Office of chromebook. This is a computer which, via the operating system OS Chrome, works substantially in line. Small size, it is to be connected to a keyboard, monitor, mouse and other peripherals. Samsung was the first manufacturer to market a Chromebox in 2012 Since early 2014, Asus and Hewlett-Packard have joined with their models. 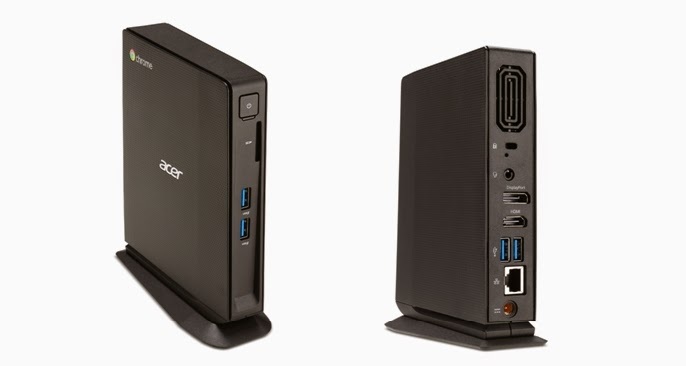 The manufacturer Acer has just introduced its first model of Chromebox. It has an Intel Celeron 2957U dual-core processor clocked at 1.4 GHz 2957U, a storage space of 16 GB expandable up to 32GB via microSD, various connection-four USB ports, HDMI, Ethernet and DisplayPort- output and is compatible WiFi and Bluetooth 4.0. Two versions are available. They differ in the size of the RAM. The CXI-2GK includes 2GB while the CXI-4GKM has a 4GB RAM. The device is a small box with dimensions 16.5 x 13 x 3.3 cm. It differs from competing models, as it is oriented vertically. It can be placed in conventional manner or can be inserted behind a screen. This new product will be initially available in September in the United States and Canada. The CXI-2GK be marketed 179.99 dollars and 219.99 dollars for the CXI-4GKM. Acer wants to meet the needs of particular companies. It suggests, in fact, "Powerwash" application, which erases data stored locally. One way to protect them during use by several people and restore the device to the next user. Also, a secure module (TPM) encrypts data for secure and easy retrieval by computer in case of theft of the device.